The best way to learn about Appalachian and what it’s like to live and learn like a Mountaineer is to visit us. Our events give you the opportunity to meet our faculty, tour campus, and learn more about majors and programs, scholarships, financial aid, the admissions process and what it’s like to be a member of the Appalachian community. All events are free for all participants unless otherwise stated. Download the Visit Appalachian app! 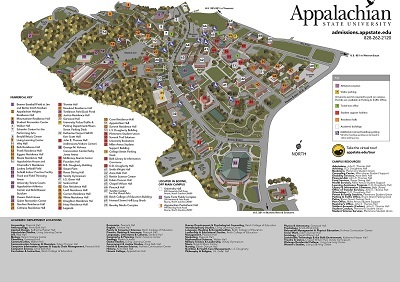 Access the campus map, directions and parking information right from your phone, check what's going on in Boone and on campus, see nearby restaurants and attractions and more. The app has it all! First-year students: learn what it’s like to be an Appalachian student – both in and outside of the classroom! The two-hour campus visit includes information about the admissions process and a walking tour of campus. Register for a campus visit! Bring as many guests as you'd like! Due to space limitations, we may not be able to accommodate all guests for our 15-minute information session. All guests are welcome on the walking tour. This two-hour visit includes a presentation with representatives from the offices of Admissions and Transfer Services, and a walking tour of the campus led by a student ambassador and transfer mentor. Learn what it's like to be an Appalachian transfer student – both in and outside of the classroom. Register for a transfer track visit! We are pleased to host your group on campus. Please schedule your tour by submitting the group visit request form at least one month in advance so we can prepare for your visit. Group tours are offered on Tuesdays, Wednesdays and Thursdays. *During the winter months, scheduled group tours are subject to cancellation due to inclement weather. To schedule a tour in Spanish, please contact Aneisy Cardo at cardoam@appstate.edu or 828-262-3107 at least two weeks prior to your visit. Para programar una visita guiada en español a Appalachian, favor de contactar a Aneisy Cardo vía email: cardoam@appstate.edu o llamando al teléfono 828-262-3107 con por lo menos dos semanas de anticipación. Download and print our campus map. You can also view specific locations and directions. Admitted Student Visits are specifically for students admitted to Appalachian. This two-hour visit includes a presentation, a discussion of enrollment steps for admitted students, a walking campus tour led by a student ambassador and opportunities to meet with university representatives. Register now! Are you interested in transferring to Appalachian? Join us for a short, fun and informative session to get you started on the right track for admission to Appalachian State University. Learn why you should become a Mountaineer, when the best time is to apply and details about transfer admission requirements and advising tips. Bring lots of questions – view dates and register soon! Your admission counselor will help guide you through the process of becoming a Mountaineer! Your counselor will be visiting areas near you and will be your point of contact as you navigate through the admission process. Find your counselor! Can't make it for one of our scheduled campus tours? Download the self-guided tour to print or use on your phone! The self-guided tour hits the highlights and shares information about different places on campus. You can also access our virtual tour from anywhere! The Office of Admissions has accessible seating options but is not able to provide wheelchairs for personal use. It is recommended that guests with limited mobility work with a medical supply store or pharmacy for short term wheelchair or mobility device options/rentals. Individuals requesting interpreter services should submit their requests at least two weeks prior to their visit to the Office of Disability Resources at 828-262-3056 or odr@appstate.edu. Individuals requesting any other reasonable accommodations due to a disability should contact the Office of Disability Resources at 828-262-3056 or odr@appstate.edu. Parking information for your event will be emailed to you in the reminder email you will receive a few days before your visit. Campus parking is complimentary for all Admissions visit programs. Directions to the Office of Admissions can be accessed via Google Maps. The physical address for the Office of Admissions is 287 Rivers Street, John E. Thomas Hall, Boone, NC 28608. Can’t make it to campus? Take the virtual tour!